Summary presents a statistical and visual overview of a sample. A histogram and a combined dot-, box-, mean-, percentile- and SD- plot give a visual summary and statistics such as the mean, standard deviation skewness, kurtosis and median, percentiles summarise the sample numerically. Normality of the distribution of the sample can be visually assessed with the histogram, or normal quantile plot or statistically using a normality test. A sample measured on a continuous scale. Select any cell in the range containing the dataset to analyse, then click Distribution on the Analyse-it tab, then click Summary. Select any cell in the range containing the dataset to analyse, then click Analyse on the Analyse-it toolbar, click Distribution then click Summary. The report shows the number of observations analysed and summary statistics. A frequency histogram, box plot, and mean plot are shown in addition to a normal quantile plot and Shapiro-Wilk normality test (see below). The mean is a measure of the central location of the sample and the standard deviation is a measure of the dispersion of observations. The shape of the distribution is described by the skewness, a measure of the asymmetry, and kurtosis, a measure of the peakedness. The median is a measure of the central location of the sample with half the observations above and half below the median. The percentile table shows the minimum, maximum and quartiles in addition to any other percentiles shown on the percentile plot (see below). METHOD Percentiles are calculated using Tukey's method which approximates the percentiles as (i - 1/3) / (n + 1/3) (see  and ). Confidence intervals are calculated for the mean, median and standard deviation. Enter Confidence interval to calculate for the mean, median and standard deviation. The level should be entered as a percentage, between 50 and 100, without the % sign. The frequency histogram shows the distribution of the sample. The bins used are chosen automatically, based on the number and range of the observations, or can be entered manually. Click Histogram bins and select Fixed. Enter Start of the first bin, Bin count, and Width of the bins. The bins must be sufficient for every observation to be classified into a bin, with no observations lying outside. 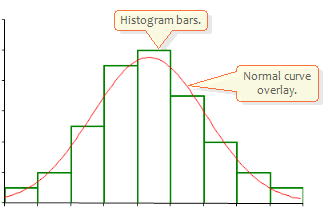 Normality can be visually assessed by comparing the height of the frequency histogram bars to a normal curve. Dot plots show the observations to allow visual assessment of the distribution and clustering of observations, and to spot possible outliers or data entry errors. Observations are jittered (Y axis) to minimise overlapping points. 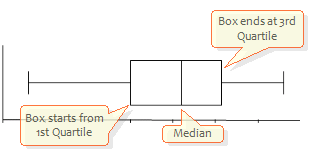 Box and percentile plots show the non-parametric central tendency, dispersion and distribution shape of the sample. 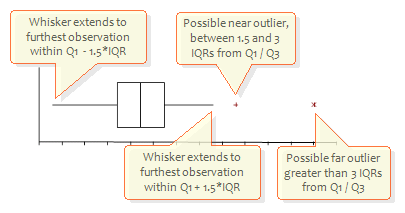 Box plot styles vary between publications with the most common styles differing mainly in how the whiskers are drawn. Click Style then select Basic, Notched, or Notched / Basic. 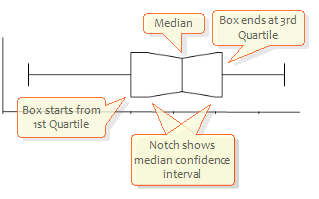 Notched / Basic shows a notched box plot when the median confidence interval is within the quartiles, otherwise reverts to a basic box plot to avoid an ugly plot with the median notch extending beyond the quartiles. Percentile plots (see below) show the range within which a percentage of the observations lie. The calculated percentiles are also shown in the percentile table. Mean and SD plots show the parametric central tendency and dispersion. The mean plot (see below) shows the mean as a vertical line, and optionally, the confidence interval for the mean as a diamond shape. SD plots (see below) are similar to non-parametric percentile plots, but show the parametric dispersion of the sample. Normality can be visually assessed from the frequency histogram, or a Normal Quantile plot and a statistical hypothesis test can be used. Shapiro-Wilk, recommended for sample sizes of up to 4000 observations. METHOD The Shapiro Wilk test uses the modified Shapiro-Wilk method and so is suitable for moderate sample sizes (see ). Anderson-Darling, recommended for sample sizes larger than 4000 observations. METHOD The Anderson-Darling goodness-of-fit test, modified for unknown population mean and variance, is used (see ). Kolmogorov-Smirnov, not recommend, mainly for historical interest. METHOD The Kolmogorov-Smirnov goodness-of-fit test, modified for unknown population mean and variance, is used (see ). The normality test statistic and hypothesis test are shown. The p-value is the probability of rejecting the null hypothesis, that the sample is from a normally distributed population, when it is in fact true. A significant p-value implies that the sample is from a non-normally distributed population. The Normal quantile plot shows the observations of the sample against the expected normal quantile. The expected quantile is the number of SDs from the mean where such an observation would be expected to lie in normal distribution with the sample mean and standard deviation. When the sample is normally distributed the points will form a straight-line. 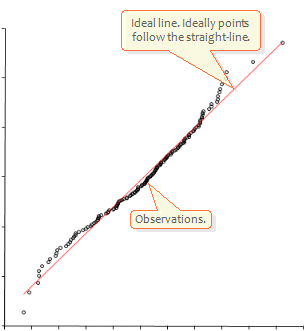 Deviation from the line indicates non-normality. Click Normality test then select Shapiro-Wilk, Anderson-Darling or Kolmogorov-Smirnov. Click Normality test then select None. Ralph D'Agostino, Michael Stephens, ISBN 0-8247-7487-6 1986. Royston P, Journal Statistics and Computing, Vol 2 No. 3 1992; 117-119. Michael Frigge, David C. Hoaglin, Boris Iglewicz, The American Statistician Vol 41, No. 1 1989; 50-55. Rob J. Hyndman, Yanan Fan. The American Statistician, Vol. 50, No. 4 1996, 361-365.